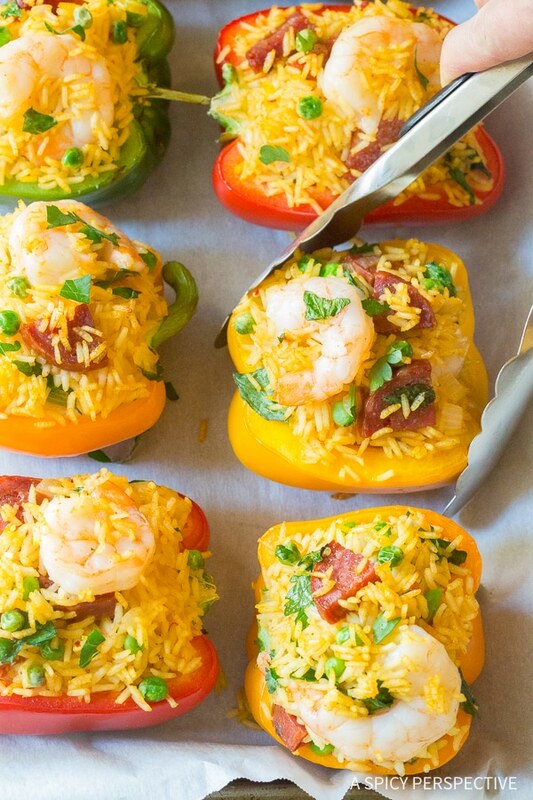 These easy Paella Stuffed Peppers, made with sweet bell peppers bowls, are packed with shrimp, chorizo and crispy Spanish rice. Stuffed peppers are one of my all-time favorite casual dishes. Whether we are making classic mediterranean-style stuffed peppers, or some other variation, I love a soft sweet bell pepper vessel filled with carbs, cheese, and spices. 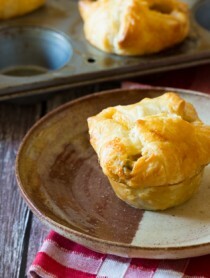 You get a hearty dose of your daily veggies, with a whole lot of comfort in the mix! Although the traditional Lebanese stuffed peppers are popular and satisfying, it’s fun to mix things up on occasion. After all, peppers (especially bell peppers) are such a light sweet universal platform, the sky is the limit when it comes to fillings. Today’s Paella Stuffed Peppers are a beloved family recipe combining the flavors and textures of zesty Spanish paella in an edible pepper bowl. 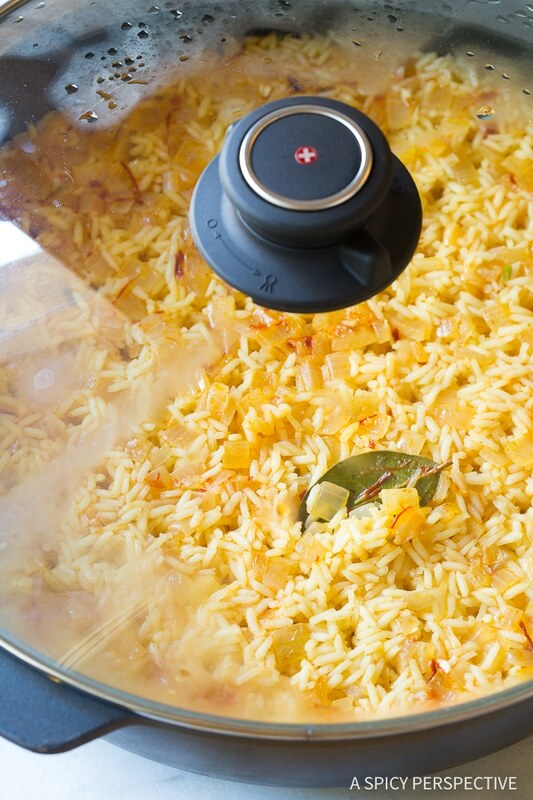 Cook the rice on the stovetop with herbs and spices to give it its unique taste. It’s best to do this in a large sauté pan with a fitted lid. I always try to cut them at an angle where both halves will lay flat so the filling doesn’t dump out. Once the rice in cooked mix raw shrimp, Spanish chorizo, and peas into the rice and fill the bell peppers with the mixture. Bake the Paella Stuffed Peppers just long enough to soften the peppers, cook the shrimp buried inside, and give the rice on top that classic crispy texture paella is known for! This Paella Stuffed Peppers recipe is so bright and perky. 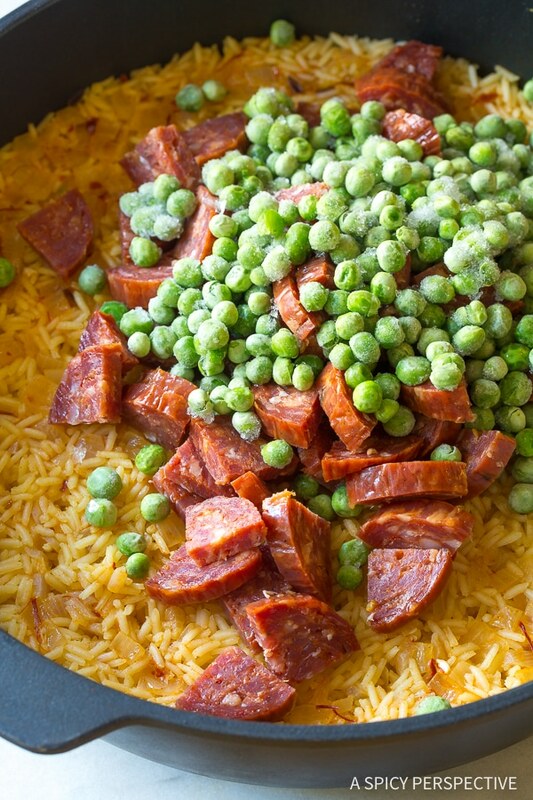 Yet the bits of spicy sausage and sweet peas balance the flavors perfectly. 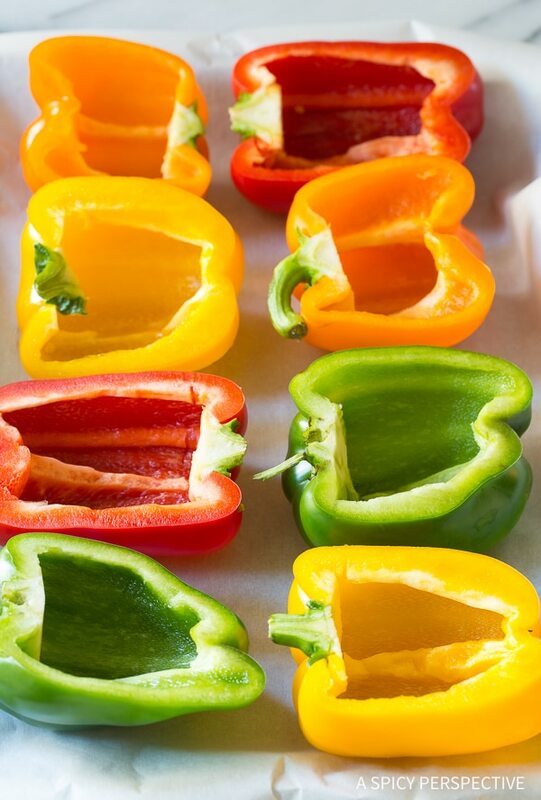 Best of all, each pepper half, packed with zesty goodness, is light and lean with only 225 calories. Can you believe that?! 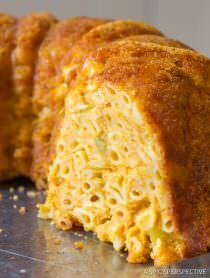 Healthy and comforting in one amazing dish. 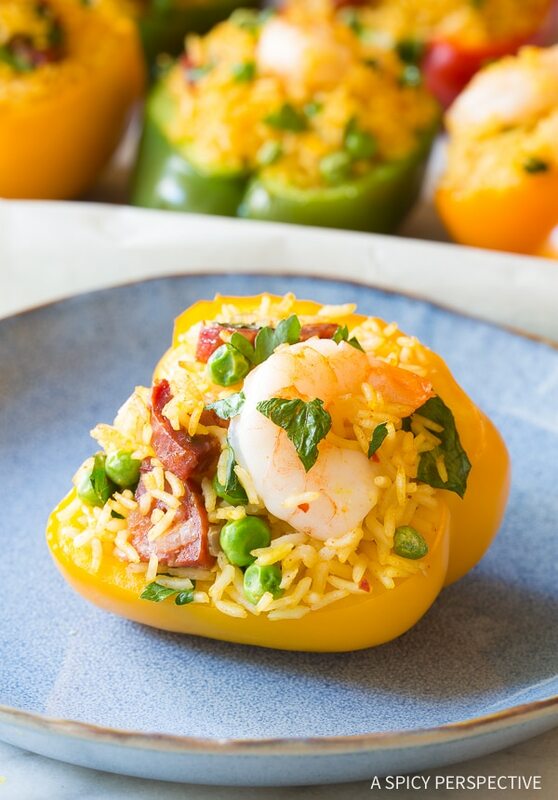 Paella Stuffed Peppers Recipe - Easy paella made with rice, saffron, chorizo, shrimp, and peas piled into sweet bell peppers and bake to crispy perfection! Preheat the oven to 400 degrees F. Set a large sauté pan on the stovetop over medium heat. Add the olive oil, onions, garlic, bay leaf, lemon zest, salt, smoked paprika, saffron, and crushed red pepper. Sauté the onions 3-4 minutes until soft, then stir in the rice and water. Cover the sauté pan with a tight-fitting lid and bring the rice to a simmer. Simmer for about 15 minutes, until the water is absorbed and there are vent holes in the top of the rice. Then remove the rice from the heat and stir in the raw shrimp, chopped chorizo, peas, and parsley. Meanwhile, cut the bell peppers in half from the stem to the bottom. 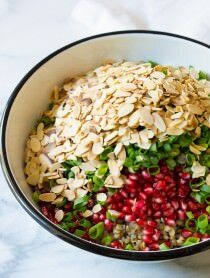 Remove the seeds and set the pepper halves on a baking sheet, cut-side-up. Spoon the paella into the peppers. Pack down, and spoon more on top in round mounds. Bake for 20 minutes, until the shrimp are cooked and the rice is crispy around the edges. Serve warm.